WASHINGTON (CNN) -- A U.S. Senate report released Thursday says some experts predict Iran could have enough material for a nuclear bomb in six months. 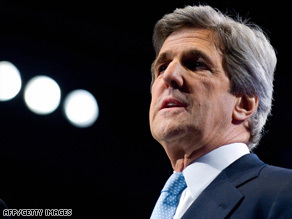 The U.S. and some allies have "deep suspicions" about Iran's nuclear program, Sen. John Kerry wrote. The staff report of the Senate Foreign Relations Committee says efforts so far to stop Iran's nuclear program have failed and that the real status of Iran's nuclear program is unknown. "There is no sign that Iran's leaders have ordered up a bomb. But unclassified interviews conducted by a member of the Senate Foreign Relations Committee staff make clear that Iran has moved closer to completing the three components for a nuclear weapon-fissile material, warhead design and delivery system," the report says. "... A foreign intelligence agency and some U.N. officials estimated that Iran could reconfigure its centrifuge cascades and produce enough weapons-grade material for a bomb within six months." "Deadlines have come and gone with Iran, and so have predictions about when it might have a nuclear weapon," the report adds. "The fact that it has enriched a significant quantity of reactor-grade uranium gives Iran the option of moving quickly if its leaders make a political decision to build a bomb. And even if Iran's current leaders do not proceed, the decision is inherently reversible as long as it retains its enrichment capability." The United States, some European nations and Israel contend Iran's nuclear development is aimed at developing nuclear weapons. Iran has denied pursuing nuclear weapons and insists the country's nuclear program is for peaceful purposes. Committee chairman Sen. John Kerry, D-Massachusetts, held a hearing Wednesday on Iran and said the report would provide the most up-to-date information about Iran's nuclear program. In a letter introducing the report, he said resolving suspicions between the United States and Iran over Iran's nuclear program is one of the obstacles to the Obama administration's goal of new engagement between Washington and Tehran. "Iran's leaders say that its ambitions are only to develop a civilian nuclear capacity to conserve the country's oil and gas reserves, but the United States and many of its allies have deep suspicions about the potential military aspects of the program," Kerry wrote. The report says international efforts, including three rounds of United Nations sanctions against Iran, have failed to slow Iran's nuclear progress. "Iran has gone from having no capability to enrich uranium six years ago to operating nearly 4,000 centrifuges at an underground facility near Natanz in the central part of the country," the report adds. "The centrifuges are enriching uranium to reactor-grade, with 1,600 more machines ready to go online." And the report warns that even without a nuclear bomb, Iran can change the balance of power in the region. "Many nations in the region already fear an ascendant Iran. Simply producing a large enough stockpile of low-enriched uranium for one or more weapons could confer on Iran new leverage over the critical region. It also could motivate some of its neighbors to seek their own nuclear capability," the report says. The report also warns of the possibility of an Israeli attack against Iran and its nuclear facilities. "A complicating factor is how Israel might respond if Iran continues to increase its uranium stockpile. There have been reports that Israel sought American support for an attack on Iran's nuclear installations in the last months of the Bush administration and was turned down. "Israel's public stance has been that Iran must give up its enrichment capabilities, so a deal which allows Iran to continue to enrich would be expected to keep the possibility of an Israeli attack on the table," the report says.